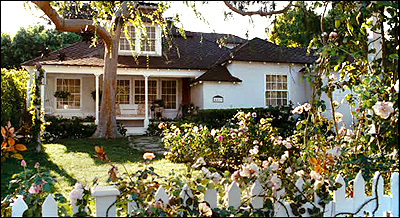 Actual Southern California locations where 2005's "Bewitched" was filmed. located at 9641 Sunset Blvd, in Beverly Hills. (at La Cienega Blvd, near Baldwin Hills). as characters such as the Gorton's Fisherman and the Jolly Green Giant. at 4848 W. 190th Street (near Inglewood Ave.) in Torrance, CA. rents can be found at 4427 Radford Ave., in Studio City, CA. about four miles northwest of Universal Studios Hollywood. knock on their door, or disturb the residents' privacy. is really "Book Soup", which is located at 8818 Sunset Blvd, in West Hollywood. The cafe is the "Book Soup Bistro", and it adjoins the book store. Most of photos on this page are stills from the DVD of "Bewitched"
(which you can buy by clicking here) and are copyright Sony/Columbia Pictures.